Many pixels have been burned over the looming L train shutdown and the day-to-day effects losing the BMT’s Canarsie Line will have on the city. We’ve talked bus bridges and Peopleway; and we’ve talked holistic solutions to an 18-month problem that will lead to longer, more crowded daily commutes for hundreds of thousands of New Yorkers. We have not talked about how the L train repairs will start over six years after Sandy’s floodwaters swept through the subway tunnels, and we have not talked much about whether the MTA could weather another storm. Last week, Neil deMause in the Village Voice shifted the focus from the Fix aspects of the MTA’s Fix & Fortify plan to the Fortify piece, and the picture is not a pretty one. Although the MTA has access to billions of dollars in relief money, the pace of spending has been slow, and the fortification efforts are far from complete. If another storm with a surge as high as Sandy’s swept through the region, the subway tunnels and stations would flood all over again, and as climate change outpaces the MTA’s ability to close nearly 6000 entry points from water can get in, it still seems as though damage from another storm is a question of “when” rather than “if”. Only fourteen Flex-Gates have been installed to date — subway entrances aren’t standardized, so each entrance plug has to be individually designed. ILC Dover is under contract to eventually provide another nine, with more than forty additional locations still waiting for the MTA to bid them out. It’s an exceedingly deliberate pace, considering that nearly four full years have passed in the city since the flooding that resulted from Superstorm Sandy, inundating much of the subway system beneath a thirteen-foot storm surge, and resulting in damage that is still awaiting repair. But the MTA proudly points to the Flex-Gate as a major improvement in response to Sandy. “Right now, today, both with our temporary measures as well as what we’re working on long term, we are far better prepared to address flooding than we were back in October of 2012,” says authority spokesperson Kevin Ortiz. Better prepared doesn’t mean fully prepared, though…In lower Manhattan alone, the subway system has over 5,600 such street openings that the MTA considers “vulnerable” access points for floodwaters. “It’s stairs, it’s vent bays, it’s hatches, it’s manholes, it’s duct entries, it’s elevators, it’s escalators,” says Ortiz. And to effectively protect the subways, every one of them has to be sealed in the day or two between a storm’s approach and its arrival. Ortiz says the MTA is working on deployable vent covers that can be triggered by subway workers in advance of a storm. But they’re not even in the prototype stage, and asking workers to cover up 5,600 openings would leave a lot of opportunity for simple human error to let the water in. deMause’s piece delves into familiar territory (the L train outage will over six years after the storm), but he adds some stark numbers to this tale. He notes that 30 subway entrances sit below the level of the Sandy storm surge and “dozens” more sit only four feet above that storm surge. With Sandy-like storms now 1-in-30 years events (and increasingly frequent as the climate changes) rather than 1-in-100 years, the MTA’s systems and low-lying tunnels will remain vulnerable for the foreseeable future. As with many things MTA, there is enough blame for the slow pace of spending to go around. The governor and mayor haven’t been particularly receptive of calls to fund the MTA, and the MTA can’t spend the money it has fast enough as either the projects aren’t in the construction stage or there simply aren’t enough qualified contractors to execute. One might even call it the perfect storm. The long endgame here is another catastrophic flood and a race to stave off destruction. The MTA would have to rethink station ventilation throughout Lower Manhattan, parts of the Upper East Side, Brooklyn, the Bronx and Queens as water levels inch upward without the help of a storm. As deMause notes, though, no one knows just how much it would take (or cost) to keep Sandy-like water out of the subways entirely, and as water will always seek out the lowest point, it may be a fool’s errand. There is no strategic retreat for the subway system, and that’s a sobering thought for New York City’s future. For better or worse, the L train shutdown is going to dominate the news coverage for the next few years as it has been for the past seven or eight months. Last week, after months of outreach and public meetings, announced the inevitable and said that a full 18-month shutdown was the choice as “the least risky way” to perform the work. And Mayor Bill de Blasio decided this was a good way to dig in on his fight with Gov. Andrew Cuomo at the expense of a prime opportunity to lead. After both deputy Mayor Anthony Shorris and de Blasio issued statements regarding the 18-month shutdown — “we are deeply concerned that it would announce an 18-month shutdown of this critical service without a clear plan or a commitment of resources for mitigating the impact of this closure,” Shorris said — de Blasio decided to double down on criticism. In comments on The Brian Lehrer Show on Friday, the mayor questioned the need for a full 18-month shutdown and immediately cast doubt upon the idea of a 14th Street Peopleway. He is taking a crisis and doing the most to lose on all issues. One of the mitigation proposals advanced by advocates is a closure of 14th Street to personal cars. Promoting the ferry network — his idea and a necessary one but also one that helps only those in Williamsburg close to the water — while throwing cold water on other people’s proposal to turn a crosstown street over to transit and buses is a very Bill de Blasio move. de Blasio, a car guy who gets driven 13 miles to his gym every morning, thinks 14th St. is important because it’s a popular motorist route. He doesn’t seem to understand the 14th Street is “important” because so many people use it as a transit corridor (and he doesn’t seem to understand how turning one single crosstown street into a so-called peopleway could be a new front in his half-hearted Vision Zero initiative). In subsequent comments on the Brian Lehrer Show, de Blasio dug in: “Most important point here is that we have to push the MTA to confirm — do they really need to do it that way? Are there better alternatives? And what are they going to do to maximize the alternatives that they can provide — buses and other things they can provide — for those riders?” As Streetsblog noted, it’s a disingenuous argument as the MTA has been talking about a shutdown for eight months, and de Blasio’s own DOT Commission is on the MTA Board and has recognized the need for city-state cooperation. The mayor, meanwhile, isn’t winning any friends at the agency with which he will have to collaborate. Take a look at this statement, via Tweet, from MTA spokesperson Beth de Falco. The mayor has a few options here. He can dig in against the MTA and fight an inevitable and unavoidable shutdown that has been particularly well planned and well presented to the public. He can avoid collaborating and ensure that DOT resources — a necessary part of any shutdown as DOT controls the streets any bustitution plan will require — aren’t used to help mitigate the L train shutdown. Or he could put this element of his dispute with Cuomo to one side and help plan a real solution to the L train shutdown. He could be a leader on street space and safe streets while working to help New Yorkers avoid, as much as possible, 18 months of transit pain. Can he rise above the bickering with Cuomo or will L train riders, already stranded by damage from Sandy come 2019, be left out in the cold by their mayor as well? No matter how you spin it, the looming L train shutdown is not good news for the city. It’s not something Gov. Andrew Cuomo is going to announce with a press release and a staged media event at the Transit Museum, as he has done in recent months with news of new-look subway cars and renovated stations. Rather, the decision to move forward with an 18-month total shutdown of the L train between Manhattan and Brooklyn, set to begin in January of 2019, is one of the MTA released to The Times on Monday morning and the world at large during its Board committee meetings yesterday. It has sent shockwaves down the BMT Canarsie line and has spurred on more bickering between city officials and Cuomo’s MTA. The existing L subway line terminal at 8 Av, which allows for a maximum of 28 trains per hour, is currently not, nor is it projected to be, the capacity constraint on L subway line frequency. Long term ridership forecasts do not show the need for frequency of service beyond what the terminal can already accommodate. Extending the tail tracks, which are tracks just beyond the end lines that can be used for storing and turning around trains, would allow trains to enter the station at higher speeds, but the large cost of constructing such a project would not justify the relatively minor gains in passenger travel time. The L train carries more than 300,000 riders per day and is a vital transit artery for neighborhoods on both sides of the East River. While we recognize the need for the MTA to perform these important repairs and upgrades, we are deeply concerned that it would announce an 18-month shutdown of this critical service without a clear plan or a commitment of resources for mitigating the impact of this closure on hundreds of thousands of New Yorkers. Well before this shutdown occurs, New Yorkers deserve clarity from the MTA on how it intends to minimize inconvenience and keep people moving throughout the duration of the construction. First of all, I’ll remind everyone the MTA is run by the State of New York. The amount of time that they have projected — the 18 months — is a very big concern for me and for the City government. We’re going to have some very serious conversations about the MTA, about whether it has to take that long and how it’s going to be handled. I want to make sure there’s a lot of redundancy in place. By the time it happens, one — small but important factors — we’ll have the citywide ferry service in place, so that’ll be helpful, but we’re going to need a lot more than that, obviously. So I want to press the MTA to show us that 300,000 riders really will have good and consistent alternatives. And we’re certainly going to look at what we have to do in terms of the bridge as part of that. We’ll have an answer on that after those discussions with the MTA. The reality is that it’s incumbent upon the mayor and his Department of Transportation to lead here. The MTA has signaled a very clear intent to work with the city to develop contingency plans, and even though a ferry from Williamsburg is likely one part of that plan, it’s clear that the MTA hopes to run constant buses over the Williamsburg Bridge, a move that requires support and authorization from the city. Additionally, numerous local officials have lined up in support of the 14th St. Peopleway, and for the MTA to realize this call for a transit-only street focusing on buses, bikes and pedestrians, DOT again would have to act. That’s firmly on the Mayor’s shoulders no matter who ultimately runs the MTA. It’s all politics to him though even when the commutes of hundreds of thousands are at stake. So we have a plan, and we have a timeline. Now, we need the contingencies. It shouldn’t be hard for various agencies to come together on a plan, and ultimately, the city can see what dedicated transit space can do. The L train shutdown will be ugly and painful and stressful for numerous communities of various backgrounds, but maybe the city and state can make the most of a crisis. Cuomo might not want to own it, and de Blasio may want to politicize it today. But when all is said and done, New York City could just be better off for it by the time mid-2020 rolls around. I sort of disappeared on everyone last week. After Monday’s report on the W train, I didn’t have anything else ready for last week, and I was in Los Angeles for a mix of business and pleasure without much time to write. I know a few readers were asking after some additional content, and I’ll try to give a heads’ up next time before I disappear for a week. On the plus side, it’s been a relatively slow news week, but with a transit system that runs 24 hours a day, there’s always something going on. Being in Southern California for eight days gave me a chance to see life in the automobile dystopia that is Los Angeles. My hotel was a few miles from my office, and I had to drive to work. Leaving at 6:30 a.m. is fine; the three miles went by in a flash. Leaving at 8:30 a.m. was a different story as the local roads were packed. Luckily, I could avoid the freeways at most peak hours, though it took an exceptionally long time to get to Dodger Stadium on Wednesday. Unfortunately, I didn’t have to chance to explore Los Angeles’ latest transit toy: the Expo Line extension to Santa Monica. It opened a few days before I arrived but wasn’t close to where I was or where I needed to be. On the first business day of operations, a drunk driver snarled morning service by driving onto the tracks. It was a very LA moment. I meanwhile was stuck in areas along Santa Monica and Sunset Boulevards. These areas don’t have much in the way of dedicated transit infrastructure because wealthy residents in the Hollywood Hills and Beverly Hills didn’t want bus lanes skirting their neighborhoods. Sound familiar? Ultimately, though, Los Angeles is engaged in a much more ambitious transit expansion plan than New York City, and it may come to fruition within the next decade. I’m doubtful it will be ever enough — without a congestion pricing plan — to alleviate LA’s infamous traffic, but it’s forward progress for a region that isn’t known for transit investment. Meanwhile, in New York, as politicians continue to claim that everything under the sun except for congestion pricing, including more ferries and more bus lanes, will solve Manhattan’s congestion problems, we pick up where we left off: with the L train. The MTA hosted its third meeting on the upcoming shutdown last week, this one in Canarsie, and although the agency had no new information to add to the public presentation, a Riders Alliance survey of L train riders found that the vast majority of them would favor the shorter, full shutdown of the tunnel between Manhattan and Brooklyn. According to the survey, a whopping 77 percent of riders said they preferred the 18-month shutdown rather than a three-year plan that would lead to an 80 percent reduction in L train service. In either case, trains will still run between Lorimer St. and Canarsie, and L train riders urged the MTA to increase service on lines that feed into or run parallel to the L, including the G, J/Z, M and A/C lines. Straphangers also requested dedicated bus lanes along 14th St. in Manhattan, more biking options and infrastructure, and increased ferry service. The city will and should implement all of these ideas once the shutdown arrives in 2019. The RPA again stressed its call to improve all facets of the L during the shutdown, and I firmly believe missing the opportunity to dig out tail tracks at 8th Ave. could go down as one of the city’s 21st Century transit mistakes. Luckily, there are three years for everyone to sort out the solutions, but it seems that the 18-month survey, as I wrote in Crains New York in April, is the way to go. The MTA has published two proposed plans for the L train shutdown. One new to New York could be forgiven for believing as though L train riders are the only people to ride the subway or be inconvenienced by long-term construction work. For six months, the entirety of the focus of news coverage of the MTA’s Sandy recovery efforts has revolved around the L train, and while L train shutdown fatigue may be settling in three years ahead of the planned work, with so many daily riders, ahead of tonight’s public meeting, the drumbeat will only grow louder as the MTA has unveiled their potential options for the work. Before I delve into the details, it’s worth noting that, no matter the MTA’s ultimate outcome, many L train riders have easy access to alternative routes. Every one traveling near or to the east of Broadway Junction can access the J, A and C trains (or even the 3 train), and those who live in Bushwick and the southern parts of Williamsburg can get to the M. The G, with all of its flaws, provides a connection to Queens, and the MTA has expressed a willingness to improve G train service and lengthen G trains during any L train work. Other routes will be more crowded and trips will be slower, but along with a bus lane across the Williamsburg Bridge, the infrastructure is in place to handle the L train shutdown. In other words, it’s not nearly as bad as the dire predictions of doom and gloom make it out to be. The duct banks that line the Canarsie Tube will have to be rebuilt entirely. That said, it’s not pretty. By itself, the L would be the 10th busiest subway system in the United States, and a prolonged shutdown will lead to disgruntled commuters. To that end, the MTA is officially consider two options. Gone is the idea, pushed foolishly by Manhattan Borough President Gale Brewer, of work only on nights and weekends. Besides a potential seven-year timeframe under that approach, MTA officials determined that, per The Times, the “complex work could not be done in such a narrow window.” WNYC notes that air quality concerns foreclose the nights-and-weekends approach. The MTA also has said that building a new tunnel is too costly and time-consuming to be a viable option. So what remains is either an 18-month total shutdown of the Canarise Tunnel or a three-year partial shutdown which would see service reduced to around 20 percent of its current volume. In each case, the MTA would run L trains between Rockaway Parkway and Lorimer Ave., but the three-year plan would create a gap in service between Lorimer and Bedford Avenues. Meanwhile, J and Z trains would operate as local and M train service would be increased. The agency would lengthening G trains to bolster capacity, and the MTA plans to work with the city to increase East River ferry service. The MTA has also expressed a willingness to establish bus-only lanes across the Williamsburg Bridge which I have long believed to be key to an alternative service arrangements. In the event of a partial tunnel shutdown, L trains would continue to run under the East River but only approximately 4-5 times per hour in each direction. After receiving input from residents and businesses, the agency plans to decide which option to pursue within three months. Asked whether he would rather close the whole tunnel at once, Mr. Prendergast said the agency was committed to hearing from the community before making a decision. But he noted that when people learned more about the plans, they often favored a full closing. “I think there is an ‘Aha’ moment they have in their minds, like, ‘Geez if it’s only one in five people you can carry, maybe it would be better to have two tracks,’” Mr. Prendergast said in reference to closing the tracks in both tubes, the more efficient of the two options. I’ve advocated for 18-month total shutdown. Get in and get out quickly seems to be better for the neighborhood that three years of frustratingly insufficient service. Meanwhile, along with word of the potential approaches to the closure, the MTA released photos and a B-roll video of current conditions in the Canarsie Tube. You can see the footage below, and the MTA stressed that the tunnel remains safe. That said, despite protestations that trains will have run for six years before work begins, the MTA says it has no choice. “A collapsed duct bank could derail a train, and the worst place to be with a derailed train is in an under-river tunnel,” Prendergast said to reporters. “The longest distance between emergency exits is in the under-river tunnels.” That is, of course, the worst case scenario but one that inches ever closer to reality. Finally, MTA officials confirmed that the shutdown would allow for new entrances to be constructed at both the Bedford and 1st Ave. stations to improve station access and passenger flow. The agency has not discussed the possibility of using a full 18-month shutdown to build tail tracks west of the 8th Ave. station, a move many transit advocates see as vital to improving L train service and line capacity. Recent MTA Board materials offered a glimpse inside the Canarsie Tube as the MTA gears up for its L train outreach efforts. As the RPA tries to make the most out of the looming L train shutdown and Manhattan riders gird for a 14th St. without subways, the MTA is slowly taking the Canarsie Tube bull by the horns. At Monday’s board committee meetings, the MTA announced that whatever shutdown the agency settles on will begin during the first quarter of 2019, nearly three years from now. With ample time to plan alternate routes, the MTA also unveiled the scope of the damage Hurricane Sandy enacted on the L train’s tunnel and later in the day announced two upcoming public outreach meetings. The big news here is the schedule for work. We don’t know if this Sandy work will involve 18 months of a full shutdown, three years of partial shutdowns or the terrible Gale Brewer-inspired seven years of no service on nights and weekends without the mitigation plan that would come with a concentrated work effort. But we do know that the L train’s riders have around 35 months to prepare for the worst. The MTA, which says it will work with NYCDOT (buses) and EDC (ferries) to prepare alternative service, will begin the tunnel shutdown before March of 2019 ends. Mark your calendars. 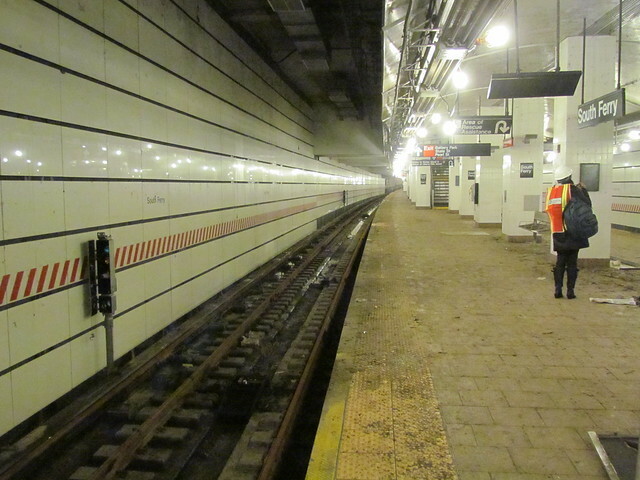 The MTA also confirmed that the Sandy work will allow for other station improvements as well. The 1st Ave. stop will indeed get ADA-compliant entrances at Ave. A, thus opening up Alphabet City to the L train, and Bedford Ave. will receive ADA treatment as well as more expansive mezzanines and and street entrances to improve passenger flow. These are sorely needed improvements, but the MTA hasn’t yet discussed the RPA’s golden egg of tail tracks west of 8th Ave. which would be a huge boost to operations and line capacity. Yet, the contract must be signed before the end of this year, and thus, the agency will work to formulate a plan for the shutdown sooner rather than later. How much a say the public has — and how cooperative the community of L train riders will be — remains to be seen. The MTA says the meetings will include “include an in-depth discussion of the potential construction approaches currently under consideration” and an open house for community members to discuss their concerns. The agency also promised to work with residents, businesses, community boards, merchant groups and civic associations along the L line, but not everyone — perhaps no one — will be happy when the inevitable happens. A politician of which I’m not a particularly big fan once said, “You never let a serious crisis go to waste,” and as we know, with the L train’s looming shutdown, the MTA has a serious crisis on its hands. What they do with that crisis could change L train service for the good or simply repeat the mistakes of the past in which the MTA, through politics, economics or both, has let prime opportunities to upgrade and improve service slip through its hands. The proposal to maximize the crisis comes to us from the RPA, and it follows Monday’s news that the Sandy-related repairs on the L train’s Canarsie Tubes will likely shutter crosstown 14th St. service as well. The RPA’s recommendations come on the heels of weeks of discussion over the best way to proceed, and the report is a comprehensive overview of the situation with additional improvements the MTA should not miss implementing. (You can read the whole thing right here as a PDF.) The key takeaways are important. Let’s run them down. 3. The key to better L service involves tail tracks at 8th Ave. I discussed this element of the proposal on Monday, but it’s worth revisiting. With tail tracks and a diamond switch, trains can enter 8th Ave. at speed, and the MTA has space for storage. The RPA also suggests a series of other station improvements, including ADA accessibility upgrades, wider platforms, and improved passenger circulation particularly at 8th Ave. and Union Square. A proposed entrance to the 1st Ave. station at Avenue A and improvements to the Bedford Ave. stop are already part of the plans. 4. Travel alternatives. The RPA report presented four travel alternatives that should be a part of any L train shutdown. These include a bus bridge over the Williamsburg Bridge, a 14th Street bus corridor with more space for pedestrians and cyclists, expanded service on the G and J/M/Z trains, and free transfers for the East River ferries. I would add more reliable A and C train service at Broadway Junction and an examination of capacity along Queens Boulevard to ensure riders can access Manhattan with minimal disruption. So what’s stopping the MTA from implementing this holistic vision for L train improvements? It’s not immediately clear if the MTA has access to enough money to perform this work, but with the capital plan due for resubmission, the MTA should take advantage of this crisis. Another problem though are pandering politicians. Just yesterday, Manhattan Borough President Gale Brewer decided she knows best and urged the MTA to take the worst approach on an L train shutdown. She claims that 7 years of no L train service on nights and weekends would be sufficient and less harmful to business which is in defiance of reality. It’s less cost effective for the MTA and would torpedo train service to Williamsburg and eastward on weekends for seven years rather than 18 months. Plus, the MTA is far less likely to implement transit-prioritization measures such as a bus bridge or dedicated bus lanes on 14th St. for a nights-and-weekends-only shutdown. There is no way around the reality that a long shutdown will not be much fun for anyone, but with the right planning and the right approach, the MTA could turn this crisis into an advantage for future L train riders. If we miss this opportunity now, will we ever get it back again? When it comes to crosstown subways, New York City isn’t particularly well-served by the current set-up. The E and M cut across 53rd St., and the Shuttle and 7 provide service across a portion of 42nd St. But no train provides nearly full-island coverage as the L train does. With five stops from 8th Ave. to 1st Ave. that provide connections to 14 subway routes (and every other Manhattan trunk line), the L is a lifeline for 14th St. and one that could disappear entirely if the MTA implements a full L train shutdown for Sandy repairs. So far, in all the discussions over the L train shutdown, the focus has been on Brooklyn and rightly so. But the L train’s five stops in Manhattan are popular in their own right, and although riders have alternate routes that aren’t too far away, the end-to-end nature of the 14t St. stops means riders in Manhattan will run into problems too. Now, as the MTA inches closer to determining some sort of solution for the L train, we have a better sense of what a shutdown means for Manhattan as well. …Business leaders worry that a tunnel shutdown could prevent customers from getting to popular nightlife and dining spots in places such as the Williamsburg area in north Brooklyn. “A full shutdown will cripple that entire part of Brooklyn,” said Carlo Scissura, president of the Brooklyn Chamber of Commerce. While closing down one direction of the tunnel at a time would let the MTA keep L trains running between Manhattan and Brooklyn, such a plan could sharply reduce service, transit experts said. The heavily used line’s capacity would drop by 75%, said Rich Barone, vice president for transportation at the Plan Association, a civic group focused on urban planning. Although the MTA has not yet settled on a plan, their internal efforts seem to be focused around one of two solutions — successive single-tube shutdowns or a full line shutdown. The idea of seven years of inefficient repairs only on nights and weekends doesn’t have many proponents within the agency. As part of these efforts the agency will have to serve Manhattan riders as well as Brooklyn customers, and while I suggested a seven-layer solution to Brooklyn’s problems, we can add another layer for Manhattan. The 14th St. corridor should devote significant space to 24/7 bus lanes to serve those riders stranded by an L train shutdown. As Tangel reports, the RPA is set to propose a dedicated right of way for buses along 14th St., and the opportunity that may arise due to the Sandy shutdown could give the city cover to see how a crosstown busway works. As you may recall, the previously proposed crosstown transitway 20 blocks to the north died a sad death at the hands of NIMBYs five years ago, and a 14th St. corridor could showcase how this idea should and can work in New York City. It is of course a silver lining to a disruptive cloud, but that L train storm is coming one way or another. Every option for a better solution during (and after) the shutdown should be on the table. Had the IND Second System become a reality with a Houston St/South 4th St. tunnel, the L train shutdown would be far more palatable. Click here for a full view of the plans. It’s hard to escape the pull of the L train these days. Brooklyn residents from Williamsburg to Canarsie are very worried about the looming threat of a shutdown of the Canarsie Tubes due to Hurricane Sandy repair work. The L has become extremely crowded, and the route is one of the few in the city without much redundancy. The real estate market is sinking; business are worried; and a potential multi-year shutdown looms. On Thursday, the MTA pushed off this work for a few years. While speaking to New York State Senate and Assembly representatives, agency CEO and Chairman Tom Prendergast said the L train repairs would be last, and work won’t start until 2018 at the earliest, nearly six years after the storm surge swept through the tunnel. For now, the temporary repairs will have to hold, and everyone will hold their collective breaths waiting for that next signal malfunction or broken rail. The biggest question posed by the dozens of anxious community members in attendance: why isn’t the MTA seriously considering the possibility of building a third tunnel running between Brooklyn and Manhattan before starting repairs to the damaged two? According to Minna Elias, New York Chief of Staff for Congresswoman Carolyn Maloney, this question did come up at the February 5th meeting between elected officials and the MTA, but was deemed unrealistic because it would cost somewhere in the ballpark of $4.5 billion and take longer than the projected timeline for repairs to the existing tubes, which could take between 18 months and 7 years, depending on how much the MTA limits service to get the job done. Many at the meeting, according to Katz, asked why other cities around the globe could build a tunnel at a fraction of the cost cited by the MTA. Elias’ response: “New York is unique.” That’s right; we are a special corrupt butterfly where everything we build has to be the Most Expensive Thing ever. If we take two steps back and set aside the immediate reaction to the idea of a third tunnel — that it would take years to conduct an environmental study, line up enough funding and complete construction and that it would take billions of dollars the MTA doesn’t have — it seems like a common-sense solution. If you have to take a road out of service, you put in a bypass. Thus, if you have to take a tunnel out of service, build a new one first. In an ideal world, the MTA would be able to build efficiently and quickly such that a new tunnel isn’t a crazy idea, and in fact, in the annals of NYC transit history, another East River crossing near Williamsburg was one part of the grand Second System plan. I wrote extensively of this idea when the Underbelly Project revealed the South 4th St. station to the world. Essentially, the tunnel would be an eastward extension of the middle tracks at the F train’s 2nd Ave. stop to Williamsburg via that old South 4th St. shell, through Bushwick and Bed-Stuy and then down Utica Ave. to Marine Park. It’s a 15 kilometer tunnel that, even at current NYC rates would likely cost $15-$20 billion to construct, if not more. It would be a truly transformative project for a wide swath of Brooklyn and one that could help support an eventual L train closure. Of course, that’s fantasyland, and here we are, back in reality. The MTA hasn’t put the wheels in motion to build a new tunnel in the 40 months since Sandy, and they’re not about to start. We don’t know why everything costs so much, but I’m comforted that more and more New Yorkers are starting to take notice. Another tunnel, as silly as it may sound, shouldn’t be impossible, but it’s a costly proposition that isn’t a priority. Thus, we’re left with an L train shutdown a few years away but inching closer. The MTA and Daniel Squadron committed to a public planning process to address the effects of a shutdown, but don’t hold your breath for that new East River tunnel. You can blame history for that one. Before Mayor de Blasio’s streetcar bombshell last week, the MTA’s L train problem had taken center stage. With word out that the agency will have to shut the Canarsie Tube for either 18 or 36 months to perform unavoidable Sandy-related repairs, the Williamsburg and Bushwick communities, to say nothing of those further east, were up in arms, and the group’s first meeting with the MTA ended badly. The MTA official sent to listen wasn’t prepared to talk, and the community organizers summarily kicked him out of the meeting. Things could only go from there, and so far, they have, bit by bit. Following meetings at the end of last week with local politicians, the MTA sent out a Saturday press release promising to work collaboratively with the neighborhoods to minimize the affects of the shutdowns. As the bench walls that line the Canarsie Tubes, for starters, will have to be torn out and rebuilt, lengthy shutdowns are all but unavoidable. The agency, however, will listen to concerns and plot alternative options as best it can. In announcing these meetings, the MTA stressed the benefits of the L line work. The agency plans to piggyback additional upgrades onto the Sandy repair work, which will include more entrances at the Bedford Ave. stop and staircases at Ave. A on the Manhattan side of the tunnel. The MTA will also install three new power substations which should allow for more frequent service. If only digging out tail tracks west of 8th Ave. were part of the plan as well. But in announcing this community consultation process, the agency stressed that, while the tubes are reliable for now, 7100 feet of tunnel need to be repaired, and there’s no real good way around that. The community group is set to convene again on February 24, but the MTA hasn’t yet pledged to attend that meeting. Hopefully, the next few sessions are more cooperative and collaborative on both sides that the last. Otherwise, this already-painful process will just become worse.